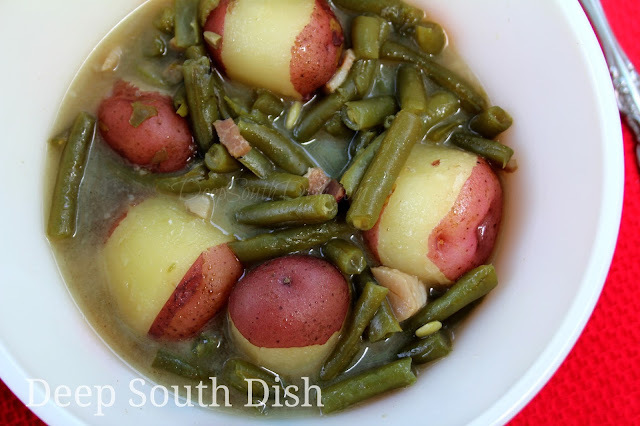 Fresh green beans, slow stewed in the Southern way with cubed or sliced fatback, salt pork or bacon and shown here with potatoes. I make my green beans the same way most of the time - a little bacon, a little onion and a little chicken broth or water. Sometimes, new potatoes are added. Doesn't matter whether the beans are fresh, frozen or canned - I use the same method for them all, and each of those elements add so much depth and flavor to green beans. I love them. But when I have the time, this is the way that I love them the most. Fresh green beans, snapped and cooked in the old fashioned way - a low and slow simmer in water, with a little fatback or salt pork and pepper is all there is to it. Once they are done, I like to stir in a tablespoon of bacon fat or butter to add just a little extra richness. Taste them first, then add other seasonings as you like. Some folks think these are "stewed to death" green beans because of the long cooking time, since fresh green beans literally cook in a very short time really. The key is slow "stewing," not boiling. You only want a very low bubble on them that allows them to barely simmer for a long time - at least an hour, an hour and a half, even better. It's an old fashioned and delicious way to enjoy fresh green beans and is truly southern style. 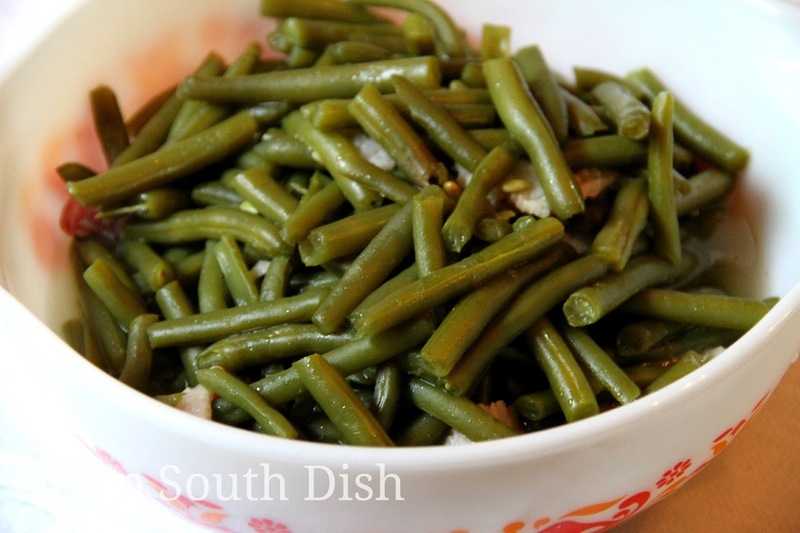 Fresh green beans, slow stewed in the Southern way with cubed or sliced salt pork or fatback. Served here with my Ground Beef Mac and Cheese and Next Day Salad. Do use fatback or salt pork for this method if you have access to it, because it makes a huge difference in the flavor, and well... that is the old way and while bacon or a ham hock will work, it's just not quite the same taste at all. You can cook up a little bacon to garnish the top of the beans if you like though. 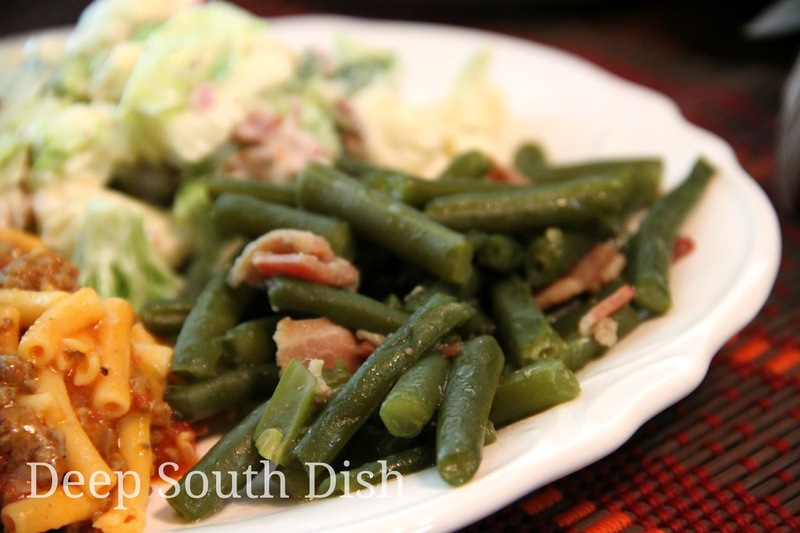 Bacon is always a nice addition to green beans! I promise though, if you grew up with slow stewed Southern green beans, the aroma of these cooking down with fatback or salt pork, will bring you right back to your grandmother's kitchen. Make them ahead whenever you can and let them set up in the fridge to soak in the pot juices. The flavor really develops and they are most excellent the next day. Always serve these beans with lots of cornbread. Here's how to make them, and it really couldn't be easier. Rinse, trim and snap fresh green beans in half or thirds. Please do not substitute canned or frozen green beans for this recipe, only very fresh beans will do here. Place into a large saucepan with fatback and plenty of pepper; bring to a boil. I mostly use a block of salt pork cubed, but had to use sliced salt pork this time, because when I made a trip to the market, that's all they had at the store. That's okay - works fine! Reduce to a very low simmer, cover and let barely simmer for 1 hour to 1 hour and 30 minutes. Remember, the key here is simmer and not an extended boil. Taste and adjust seasonings, adding salt only as needed, and any other seasonings you enjoy. Stir in the butter or bacon fat. Now, if you've made these ahead of time, all the more better! When these beans sit over night in their stewed juices, they are even more marvelous than when you made them the day before. I would agree that these are a bit nondescript in their appearance, but oh my heavens the flavor. Out of this world. Do try them this summer when green beans are fresh and at their peak! Check out more of my green beans recipes on Pinterest! Rinse, trim and snap green beans in half or thirds. Place into a large saucepan with water, fatback and pepper; bring to a boil. Reduce to a very low simmer, cover and let barely simmer for 1 hour to 1-1/2 hours. If adding potatoes, scrub the potatoes and peel a strip away from the middle of each potato and add to the pot about 20 to 25 minutes before they are finished; cover and continue cooking until tender. Taste and adjust beans for seasonings, adding salt only as needed. Finish by stirring in the butter or bacon fat. Cook's Notes: Remember, these beans are slow stewed, not boiled. They need to remain on a very bare simmer the entire cooking time - do not let them boil. Use fresh, raw green beans only, not frozen or canned. Do not substitute. Ham hocks or bacon are a suitable stand-in if you must, but the taste is not at all the same, although chopped, cooked bacon is a nice garnish. For the Slow Cooker: Prepare as above placing in slow cooker. Cover and cook on low 4-6 hours. Electronic Pressure Cooker: While the flavor is not as intense as slow stewed, these are still delicious. Add beans and potatoes, if using, to pressure cooker with 1-1/2 cups chicken broth, pork seasoning and black pepper; seal and pressure cook on high for 4 minutes. Quick release. 50 HUNGRY PEOPLE COMMENTED. ADD YOURS! I grew up on cooked-to-death green beans, mom used bacon, and that is still the only way I will eat them. So I'm with you on the ingredients, except we generally use a country ham hock in ours. Try it with fatback or salt pork sometime Larry! I can tell this is a wonderful recipe when you mentioned that they taste even better the next day. So many of my favorite recipes taste better when the flavors can marry, Not being a Southern girl, I have never had these but I bet they are delicious. I'm from eastern KY & I love Southern made green beans. I grew up in n.e.Ohio where in school we were served green beans right out of a can without seasoning--Yuk. My mother, and I, make them with salt pork or fat back, depending on what's available. Like Big Dude's Mom mine cooked them to death, they were dry at the end of cooking-no broth was left in them. They were wonderful with new potatoes. She grew & cooked mostly white half runners which are, in my opinion, the best green beans. Oh you gotta try it with that pot likker for sure! My mouth is watering. This sounds good with cut up cucumbers on the side. Yum! I love them like this too!!! Man oh man, I miss fatback. Especially with my grandmother would fry some for me. I like to use jowl bacon in my green beans when I can find it because it's like a cross between bacon and fatback. My mother cooked them with fat back, salt and pepper. The only difference is she would start frying the fatback and get it hot then throw in the beans, put the pan under running water, getting a great sizzle and steam. Add pepper then salt as needed. Then, low and slow like you say for an hour or so. And yes, better the next day. If we had leftover corn and beans, she would add them together. Or potatoes, same way. This is the best way to eat green beans. I mean I like them prepared the faster way, even steamed or bacon wrapped, in salads, whatever, but this way is my number one favorite definitely. Love, love, love green beans cooked this way. I live in Atlanta which used to be southern city and you could get green beans in restaurants like this. Now, if you want them like this when you eat out you have to go to Cracker Barrel! Thanks for this truly Southern recipe. You are so welcome! During the summer I prepare them this way much more often than the rest of the year & they aren't a lot of trouble once you get them going and SO delicious the next day. I didn't realize that Atlanta had changed that much - been years since I visited there. Thank goodness for Cracker Barrel!! My mama and grandma cooked green beans just like you described. Being Cajuns, we ate them over rice. None of that cornbread stuff for us. I also remember picking those beans for mama. Mouthwatering memories, to be sure. I've never done these over rice, but I am guilty of combining them a bit on my plate. :) We eat a lot of rice over here in South Mississippi too! OMG! Were these ever sooo good. Made with salt pork and added butter at the end. Thanks Mary, in my favorites! You're welcome Elizabeth! I could just eat the whole pot for supper - I'm so glad that you enjoyed them too!! This is my favorite way to eat green beans! I am making these for dinner tonight. My Mama used to put up a garden every summer. I remember sitting and snapping or shelling beans. I moved to Atlanta from central Mississippi. When Mama and Daddy were still living, they would always make me a pot of these when I would go home for a visit along with butterbeans. They always cooked them in their old cast iron pot. The best way to cook green ever! Thanks for sharing! What a wonderful memory - thanks so much for sharing it!! Hi there, great site! I made spoon bread with southern style green beans. I used thick cut bacon, garlic in addition to onion, deglazed the pan with vinegar and added a little sugar, and I simmered with chicken broth not water. Soooo good! I have this on the stove right now! I bought salt pork & hamhock for it, bit didn't put in hamhock, since you said it wouldn't taste the same. You can certainly use the ham hock - I just like these better with the salt pork myself! I grew up in the south. We had a large family and a huge garden. This dish was a mainstay in our house and I dont remember there ever being leftovers for the next day! Unfortunately work took me up north, and in my opinion, yankee cooked green beans taste like grass clippings. 7 inches long, crunchy, barely hot and oily. Yuck. Must be why everyone up here is grouchy. Mama sure could cook. Oh my, I have to admit your comment sure gave me a chuckle this evening!! Now you have me really worried. I had some green beans I froze from my moms garden and started a pot of the beans using the frozen... dang if I mess these up my daughters will be calling my mother and telling on me!!! Oh gracious! No worries. While fresh are best, frozen will work, especially those from the garden - just check them earlier. Greetings from the American in Dubai! We're a day late but doing Christmas dinner today and I'm making these along with pork roast with crackling. My husband is British so we always do combo celebration meals where American southern cooking meets Brit! Now I wouldn't mind being a dinner guest for that! luv your site? can this be done in the crockpot? Absolutely - low for 4 to 6 hours. Mt parent's family is from Albany,Ga. It doesn't get any more southern! My best memories are sitting at my Mama's kitchen table with my Mom and Great Grandmother snapping beans and shelling peas. The table covered in newspaper and mounds of fresh vegatable and priceless conversation! That is indeed priceless Jill! I call these "Grandma style",because this is how she would always prepare them. She was born near the Tennessee/Kentucky state line. So delicious! Made these yesterday with some salted sliced fatback, all I could find, waiting til today to serve them. They are going to be such a big hit (I tasted them YUMM) My only problem is that Kroger had the beans on sale and didn't have 2 whole pounds of beans left, so we're going to wish there was more! Think these will freeze well? because I want to make these ahead during prime bean season for serving at Thanksgiving. They should freeze fine - haven't ever done that because there aren't any left! I have made them ahead and held them in the fridge for a few days though. Hope y'all enjoy them Bonita! I really want to try this, and it sounds great! It's so early in the morning and I already want green beans.. They look so delicious! Yum! I asked my uncle once why my green beans never turned out as good as I remember my grandmother's tasting and he said she probably used fat or meat I wasn't adding...thank you for the perfect recipe to honor my grandmother Oklahoma Miles Sain with! That makes me so happy Dana - thank you for letting me know! If doing in slow cooker would you add potato at the same time? Yes, but don't overcook the potatoes! Check them at the 4 hour mark. Made these again, this time using bacon. Since my crew didn't like the "blobs of fat" from the salt pork, this time we rendered diced up bacon first just enough to melt the fat before adding the water. Our new Sprouts store had fresh beans in big bags, maybe 3 lbs? Cooked them all, only increasing the pepper and water slightly to compensate. Feeding only the 5 of us our Easter dinner, still only had 1.5qt left! That was Sunday - now there's none left, the crew went after them like they're Easter candy! I'm sitting here trying to decide what kind of soup to make with the leftover liquer! This is exactly the way my Granny used to cook her green beans, and I loved them so much. I cook them the same way, with saltpork, but instead of using plain water I use low-sodium chicken broth (Due to blood pressure problems, I'm on a low salt diet). Absolutely the best green beans you can possibly eat! I just love these made with the salt pork! I mostly use water, but I'll throw in some Better than Bouillon sometimes myself!